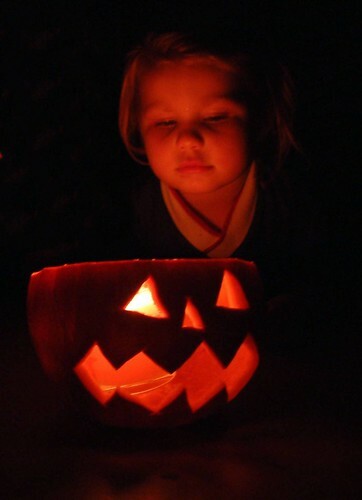 Little Charlotte and the pumpkin, a photo by PhylB on Flickr. I've gone and made pumpkin soup again - probably for about the 15th year in a row. It tastes rather bland... as it did last year and the one before and although it isn't offensive, it is simply a nothing soup... so I'm blogging it in the hope that next Halloween I stumble upon what I am writing tonight and don't, once again, rustle up four litres of pumpkin soup, and instead opt for one of my other, more exciting soup recipes! I like pumpkin soup. Made on chicken with lots of ginger, garlic and chili and with leeks and soy sauce. Mine has chili and cumin - thanks for the tip - when I accidentally make it again next year I will add what you suggest! Do you use one of the big pumpkins or one "made" for food, like butternut or hokkaido? I've heard that the big pumpkins are useless for food. I don't mind cumin in curries... but I think you are right I need nice pumpkin not these silly carving ones - I just get tempted because they are only £1!